Traditional dishes seem to naturally reflect what’s being pulled from the ground and the branches at Thanksgiving. It’s no coincidence. The day commemorates a temporary moment of peace between European colonists and Native American people, and our modern manner of celebration is rooted in the European festival called Harvest Home that grew to incorporate Native foods. I'm curious what food you put on your table, and I'll be asking about your traditions at the end of this article. 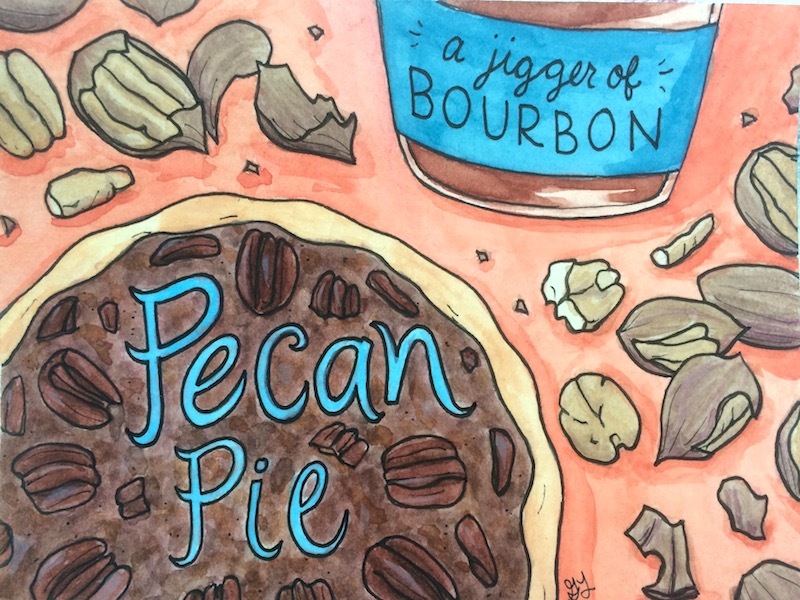 A few hours south of Montgomery, Alabama, I finally learned why pecan pie is so often on the dessert table. On our drive up the highway, we saw a sign for Harper Orchards pecans. Then another. And another. Of course, we had to stop. We followed arrows into a thick, drizzly forest and arrived at the quaint storefront. As we’d soon learn, this section of Alabama gets over 70 inches of rain per year, and pecans love it. We walked in and were greeted in that warm, Southern way by Julie Harper, who married into the family business. She took time between taking orders for 10, 20, and even 30 pounds of pecans to answer my very important question: How does one properly pronounce “pecan”? Because nuts have such a long shelf life, I spend little time pondering when they’re actually picked. But there’s a reason why we make pecan pie for Thanksgiving: November is the height of their harvest. What a glorious way to celebrate a fresh pull of pecans: mixing them with sweet syrup, pouring them into a buttery shell, and baking until they’re a deep, caramelized brown. Julie recommends, depending on your audience of eaters, adding a jigger of bourbon to the treat. On our way out, Julie handed us a satsuma, an orange citrus fruit, which is also ready for harvest at this time of year. Coincidentally, we passed Satsuma, Alabama on our highway drive and saw many trees heavy with the fruit. Perhaps many a Thanksgiving table features these jewels, too. Can you help me? I'd love to know what traditional dishes you make for Thanksgiving to celebrate the harvest of your locale. I'm curious how they differ around the U.S. Let me know in the comments below and I may use your answer later on in this 'Traditions Across the U.S.' series. Through art and story vignettes, this series highlight the traditions I had the privilege of experiencing on this trip and prompts you with tangible ways to revive, reflect, and start food traditions of your own. Because I believe, whether you’re moving or staying put, proudly sharing food that says “this is who I am and where I’m from” can be one of the greatest joys of a well-lived life.